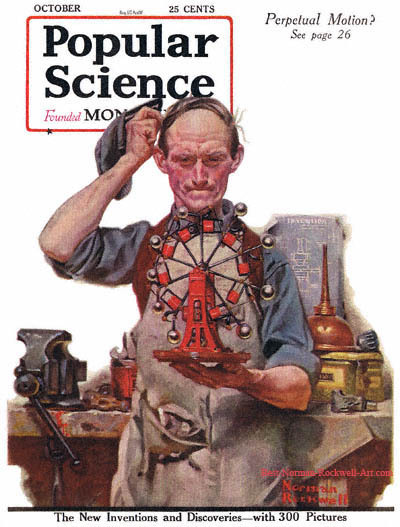 Perpetual Motion, this Norman Rockwell painting, appeared on the cover of Popular Science published October 1920. This was the first illustration by Rockwell to appear on the Popular Science cover. Popular Science only published two Rockwell illustrated covers, spread between 1920 and 1921. The full name of the magazine was Popular Science Monthly. The 'Monthly' was later dropped. Rockwell only submitted to this and other smaller circulation magazines after the publishers of the larger magazines had declined to publish the cover illustration. Motion that never ends... This has been a dream and goal for many inventors throughout the years. Rockwell painted this illustration as an eye-catcher for one of the articles inside, on page 26. He did a thorough job on this painting, accurately portraying an inventor's work bench. To me, the implication of this painting is that this enterprising inventor has constructed such a machine. Yet he has removed his cap to scratch his head. It is as if he is asking himself how it works. Now I'll leave the research to you to determine whether the idea is even feasible. I only see one possible incongruity. I am sure Rockwell thoroughly researched this topic before starting to paint. However, would not the device have enough energy that it would not just sit on his hand? I am not well-grounded in physics, but it seems like that machine would be pretty wobbly if it were not secured somewhere. The machine also resembles a Ferris wheel, probably Rockwell's inspiration for the device .